Your entry door is one of the parts of your home that is constantly being bombarded by mother nature, as well as the torment of every day use. For this reason these doors are built to withstand a lot of abuse, but sometimes they even need a little t.l.c. There are many types of repairs that your door may require, some are very simple, and some may require a little more effort and know-how. Repairing a Sticking Entry Door - Over time houses and other buildings can settle and cause the entry door to require a little more effort when opening and shutting it. This can be as simple as lubricating the hinges or the door itself may need to be adjusted on its hinges within the door frame. Repairing Dents - Many entry doors are covered in a metal skin, this commonly results in dents over years of use and abuse. It is much cheaper to fix these dents than it is to purchase an all new door. Dents can be easily fixed with the body filler that is used in the automotive industry. This filler can be purchased at any auto parts store and is very simple to use. It will require some patience and sanding, but the end result will be a dent free door that you can then paint any color you want. Squeaky Hinges - Over time the hinges on your door can corrode and begin to squeak when opening and closing the door. By disassembling the hinges and cleaning off the corrosion you should be able to lubricate them and stop the squeaking. If this doesn’t fix the problem, then it may be time for some new hinges. DIY Door Store has a great selection of hinges for any need. Stopping Air Leaks - As a home or building moves and settles, it is possible that air leaks will develop around your entry door. These air leaks can allow the climate controlled air in your home to escape and your energy bills to rise. Fixing an air leak is a simple task. First look for any cracks in the caulk around the door frame and replace as necessary. Next inspect and replace the weather-striping around the door or install a door sweep to make sure that the door has a tight seal to the door frame. Replacing an Entry Door - Sometimes an entry door is past the point of no return and it is easier and more cost affective to simply replace the door. There are many different choices for entry doors on the market and it can become overwhelming. First, take measurements of the old door to have when ordering the new one. Next, choose the style and materials of the new door, as well as what type of hardware will be used in the door. The old can be removed easily by disassembling the hinges, then reverse those steps to install the new door. Sometimes it may need to come on and off several times to fit it properly. 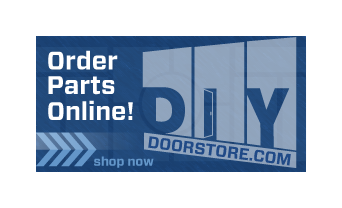 The DIY Door Store Can Help - Whether you are repairing your existing entry door or are looking for a brand new door DIY Door Store can help you get the job done. 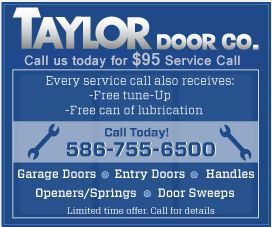 For all of you other door needs contact Taylor Door Co. or call (800) NEW-DOOR.